Brilliant Earth’s jewelry experts select every item in our Vintage Collection, taking into account beauty, craftsmanship, gemstone quality, and originality. These works of art reflect the spirit of their eras as well as the vision of the artisans who designed and produced them. To mark our ten-year anniversary we’re taking a look at some of the most extraordinary vintage rings that have graced our collection in the past decade. These are the beauties that our antique experts fell for and customers clamored for. 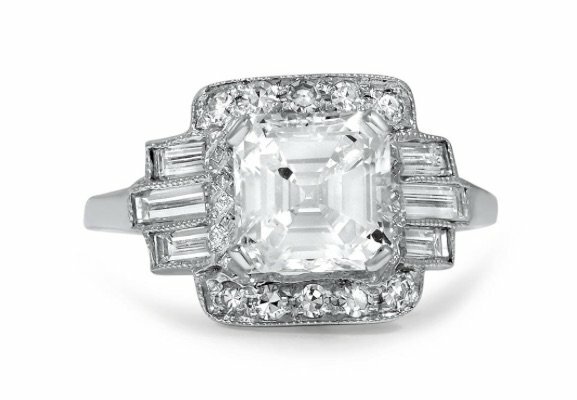 The extravagantly luxe Art Deco-style Annabelle Ring displays a stunning asscher cut diamond accented by ten round diamonds above and below it and six baguette cut diamonds gracing the shoulders for a look of glamorous sparkle. Fine milgrain detailing adds to the unmistakably antique look. Breathtaking is the only way to describe the 4 carat cushion cut diamond at the center of the luxurious modern estate Princesa Ring. Once our most viewed vintage piece, the Princesa is an unforgettably classic design. 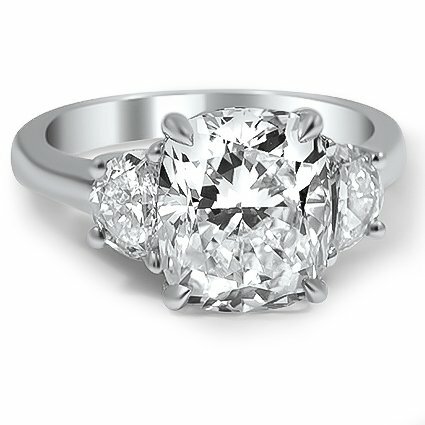 The center gem is secured with chic claw prongs, and accented by two half-moon shaped diamonds. It is named for the French word for “queen” and the vintage Reine Ring looks like it should grace the hand of a monarch or Hollywood royalty. 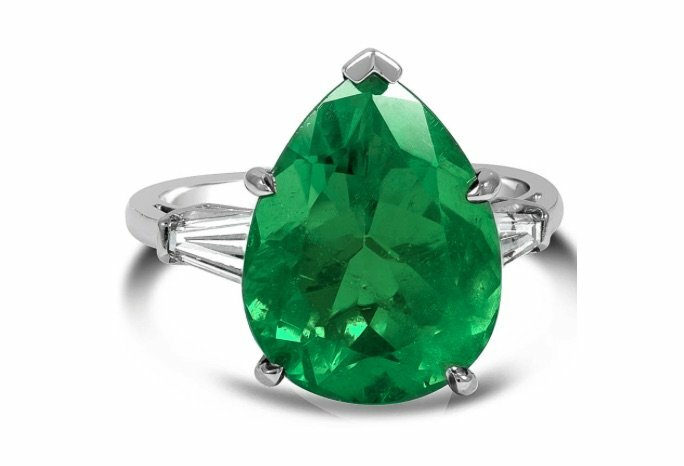 This platinum ring showcases a pear-shaped natural emerald of jaw-dropping beauty, accented by two baguette diamonds. 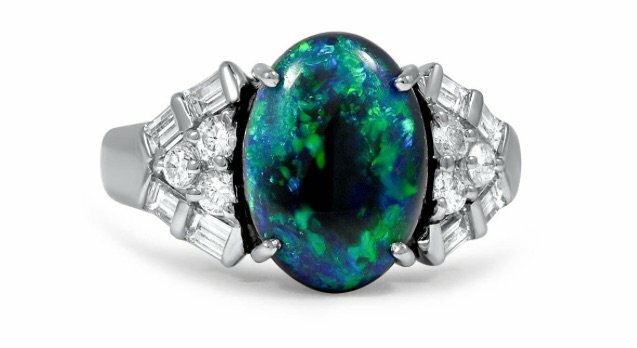 A beautiful example of the dramatic glamour of the Retro era, the Evonne Ring features a mesmerizing black opal cabochon with strong play of color. Round and baguette cut diamonds in a chic pattern accentuate the shoulders, completing the truly sensational look. 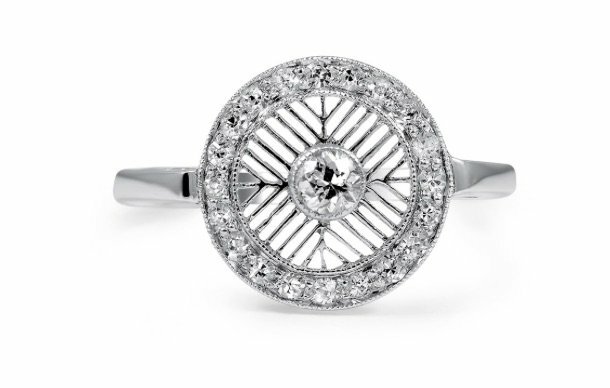 A gorgeous example of sublime vintage artistry and craftsmanship, the Shalon Ring is a reproduction of an Art Deco design. 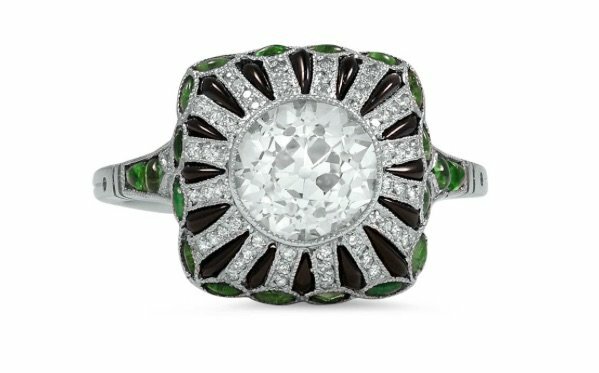 It features sixty round brilliant diamond accents, sixteen carved onyx cabochons, and twenty natural emerald cabochons in a chic pattern that radiates from a stunning old European cut center diamond. The Voysey Ring surrounds a bezel set old mine cut diamond with six diamond-shaped sapphires and twenty-eight sparkling diamond accents in this sublime Art Deco design. Delicate filigree weaves a feminine pattern between the gems, and milgrain and filigree embellishment adorn the gallery and the shoulders, for an ornately detailed effect. An enchanting example of whimsical Retro-era style, the Etoile Ring features a glamorous cluster of diamonds in an asymmetrical, nature-inspired design. The diamonds are framed in white gold embellished with milgrain, creating an ornate and quintessentially vintage effect. 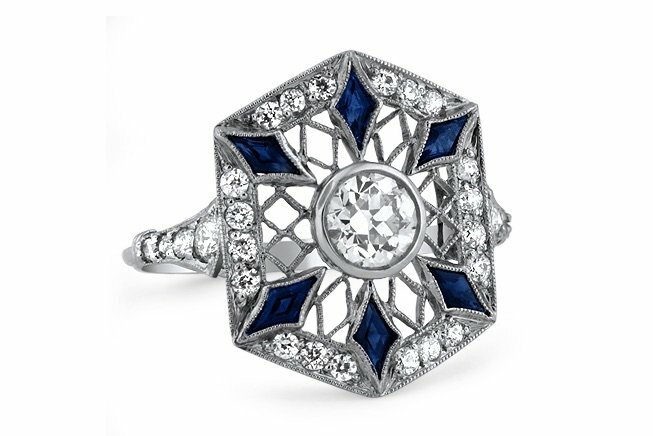 Intricate latticework surrounds a dazzling old European cut diamond in the Art Deco-era Derrylin Ring. Twenty single cut diamond accents shimmer in a perfect circle at the outer edge of the ring. One of our most sought after vintage rings yet, the Derrylin will soon be re-created by our master jewelers and introduced to the Brilliant Earth collection. 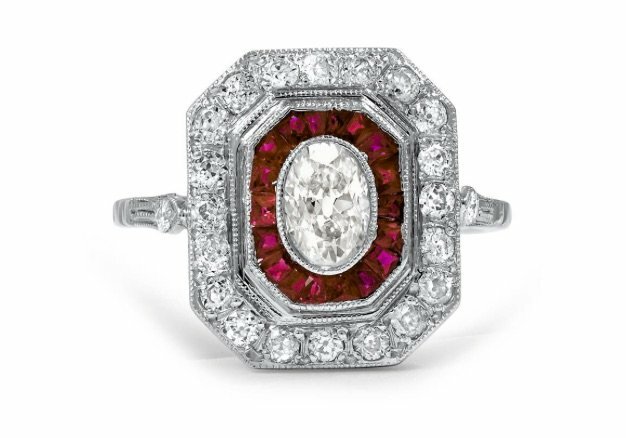 The mesmerizing Dagmar Ring draws attention to a bezel-set oval diamond at the center of a breathtaking double halo of French cut natural rubies and old European cut diamonds. 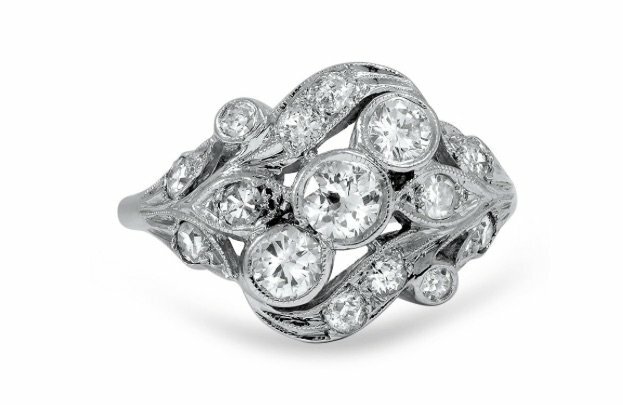 The remarkable milgrain detailing adds to the extraordinary beauty of this platinum Art Deco ring. The elegant lines of an emerald cut diamond are accented by eight sparkling single cut diamonds in the dazzling Art Deco-era Kiyomi Ring. Delicate milgrain embellishment adds a romantic antique feel to this glamorous design. Which of these top 10 vintage engagement rings is your favorite? Let us know on Facebook or Twitter, or in the comments section! Hi Ammy, the Evonne Ring is $8,500 and you can view it on our website here: http://www.brilliantearth.com/The-Evonne-Ring-Platinum-BSF54197V/. Thank you for your interest! 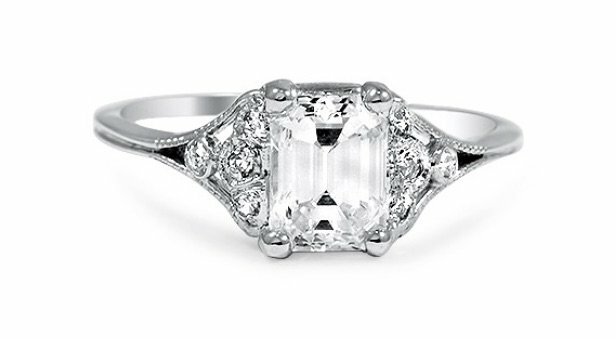 Hi Cary, the Kiyomo Ring is approximately 1.34 carats. This ring was one of our one-of-a-kind vintage pieces, which unfortunately has already sold but you can still view it on our website here: http://www.brilliantearth.com/The-Kiyomi-Ring-Platinum-BBN93101/. Our jewelry specialists would be more than happy to help you find a similar unique antique ring, or help you design a custom reproduction! You can reach them at 1.800.691.0952 or via email (http://www.brilliantearth.com/contact/). Thank you for your interest! What is the price of the kiyomi ring and how many carats are is it?